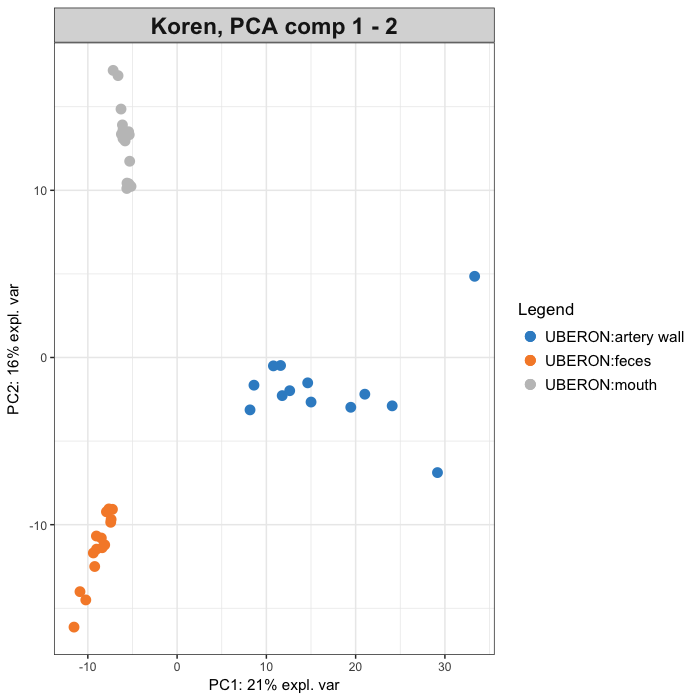 Here we apply mixMC to the 16S study of Koren et al. (2011) who examined the link between oral, gut and plaque microbial communities in patients with atherosclerosis and controls. Only healthy individuals were retained in the analysis. 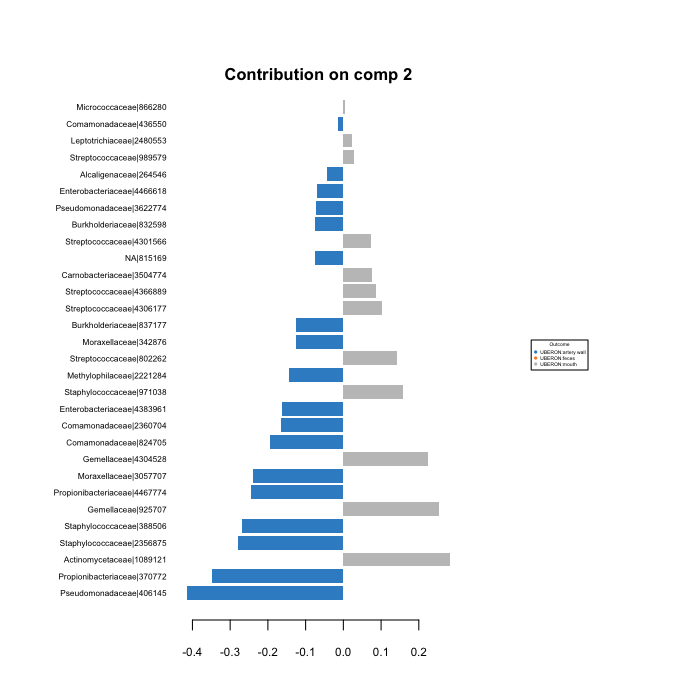 This study contained partially repeated measures from multiple sites including 15 unique patients samples from saliva and stool, and 13 unique patients only sampled from arterial plaque samples and we therefore considered a non multilevel analysis for that experimental design (i.e. no repeated measurements). The data were downloaded from the Qiita database. After pre-filtering, the data included 973 OTU for 43 samples. Data were TSS normalized and log ratio transformations are applied in PCA and PLS-DA. Using the Koren data in this example we assume the data are prefiltered and normalised with TSS, as described in mixMC pre-processing steps. We set up the outcome Y as a factor indicating the body sites of each sample. A repeated measures design is not nessessary as each sample is not repeated more then once. PCA allows for dimension reduction of the data and visualisation of diversity patterns in microbiome studies. Because we are dealing with proportions, the data are compositional and spurious results can arise if the data are not transformed into an Euclidean space. Therefore the Total Sum Scaling normalised data must be transformed using either ILR or CLR. Here we chose the ILR transformation as advised by Filmozer et al . We generally prefer the ‘CLR’ log ratio transformation as it is faster and can be used all throughout our framework (from PCA to sPLSDA), using the argument logratio = 'CLR'). We first run a PCA with a sufficiently large number of components ncomp to choose the final reduced dimension of the model. 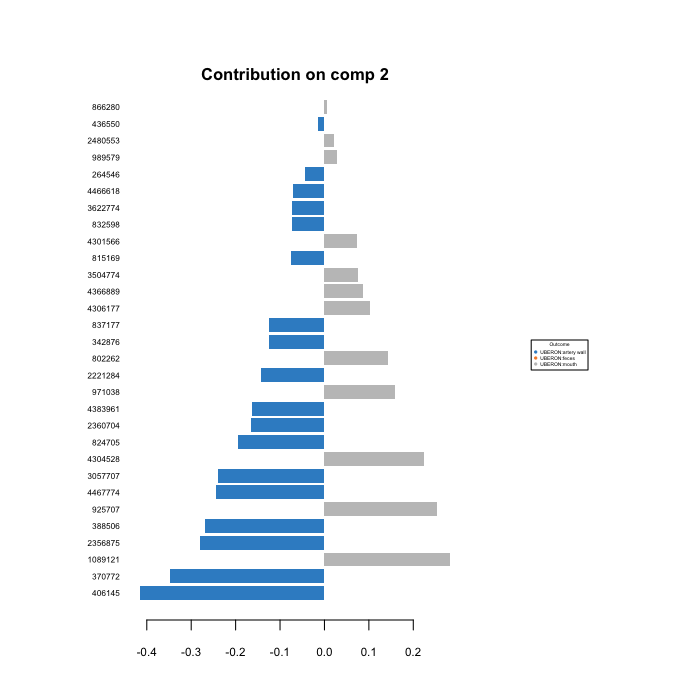 The barplot above depicts the percentage of explained variance per component for a PCA with 10 components. It is a good indicator of how many components to retain in the final PCA model (here two components will be sufficient). 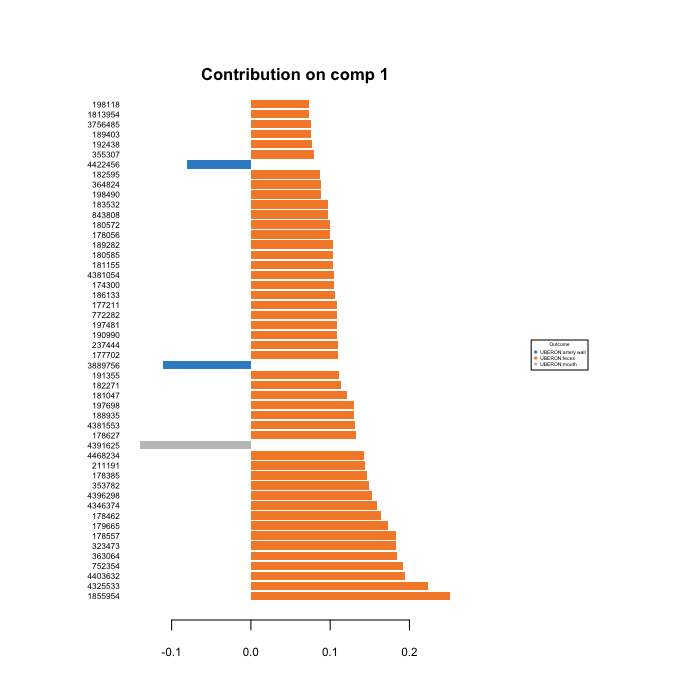 The sample plot below displays the samples colored according to Y, but note that PCA does not take Y into account in the analysis! The mixMC frameworks uses the sPLS-DA multivariate analysis from mixOmics. The sPLS-DA selects the most discriminative OTUs that best characterise each body site, see sPLS-DA. Note that with PLS-DA and sPLS-DA we can only choose a CLR transformation (see details here. We first run the perf function with a PLS-DA model with no variable selection. 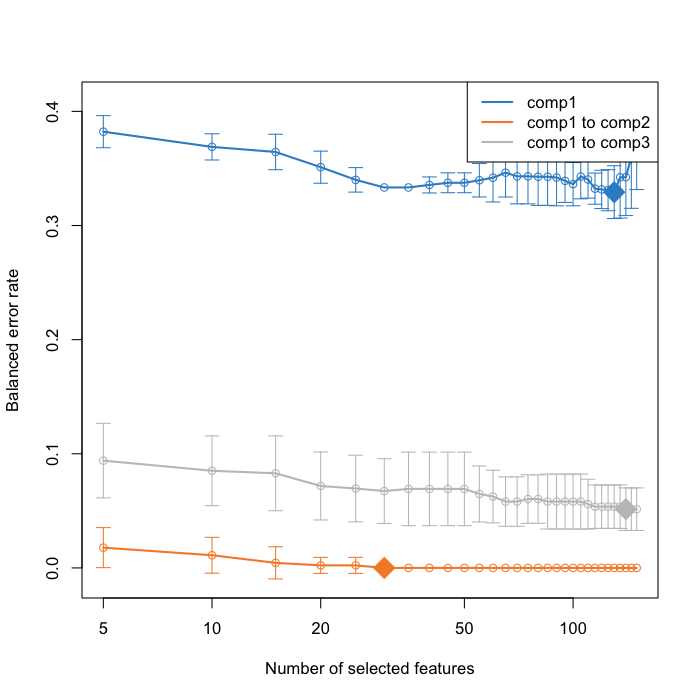 Often ncomp = K-1 where K is the number of categories in the outcome Y is sufficient, but it depends on the data. We choose 5-fold cross-validation repeated 10 times. To obtain a more reliable estimation of the error rate, the number of repeats should be increased (between 50 to 100). 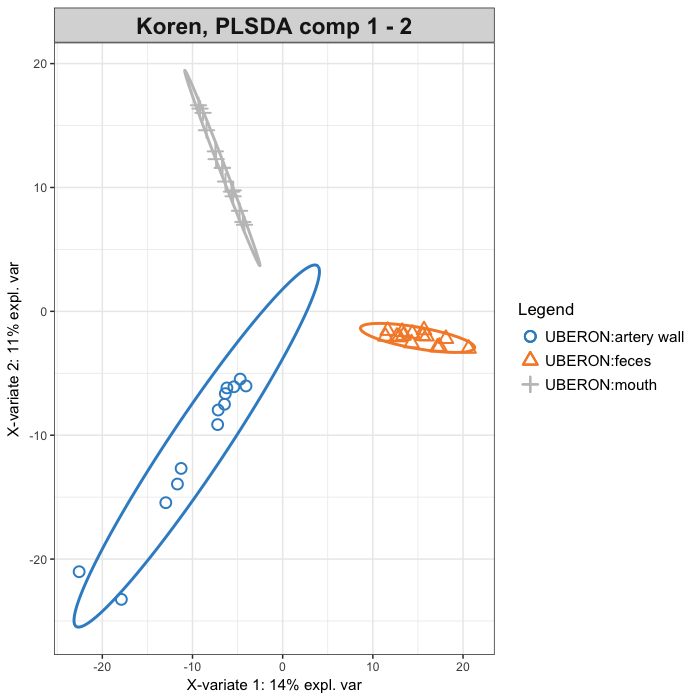 Here we assess the performance of the PLSDA on 3 components. 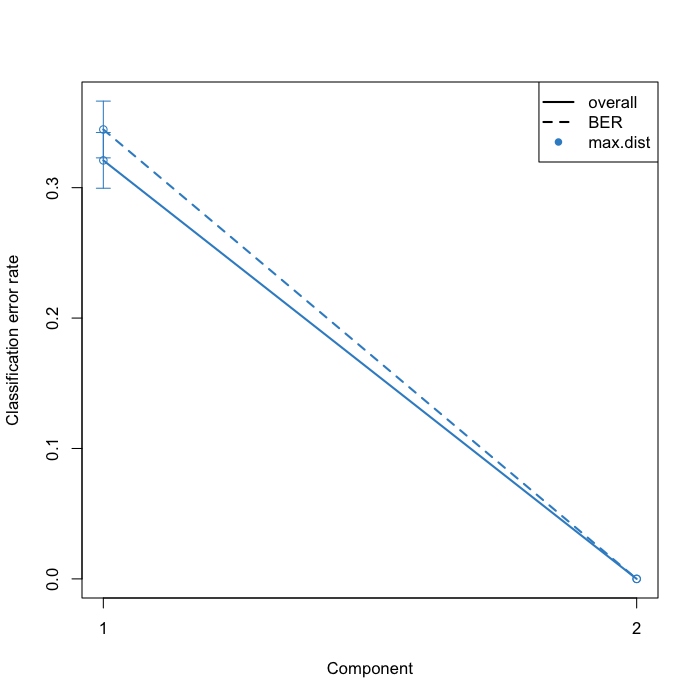 The plot indicates a decrease in the classification error rate (i.e. 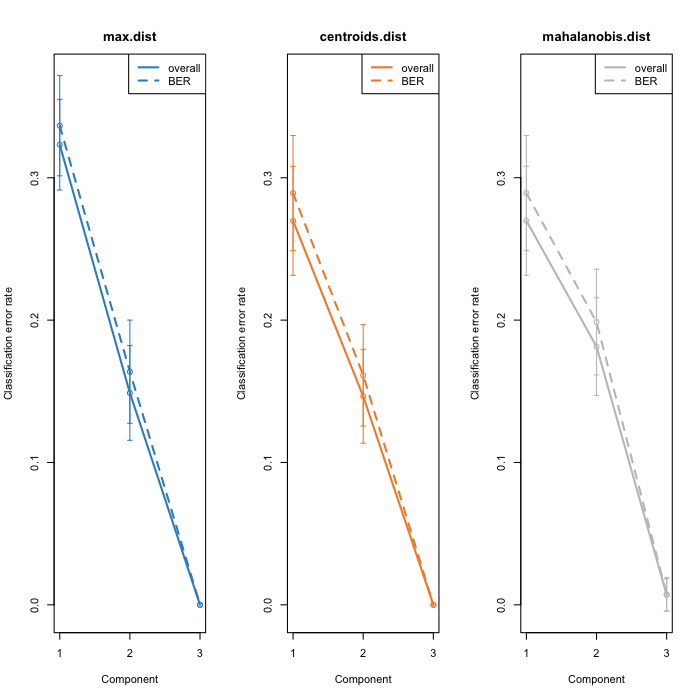 an increase in classification performance) from one component to 3 components in the model. The BER stands for Balanced Error Rate and should be considered when we have an unbalanced number of samples per group. Here the number of samples per group is very similar, which explains why both overall and BER are overlapping. The performance reaches its best for 3 components, which suggest ncomp = 3 for a final PLSDA model. Note that for the sparse PLSDA we may obtain a different ncomp. For more details on the prediction distances, refer to Suppl info in Rohart et al. 2017 . Here all distances are similar, we choose 'max.dist' for sPLSDA. It is possible that the third component may not visually add much to the model and could be ignored. The parameters to choose in sPLS-DA are the number of variables to select (keepX) and the number of components (ncomp). To do this we use the function tune.splsda. In this example the sPLS-DA tuning step is performed on 3 components, using 5-fold validation repeated 10 times. tune.splsda needs to be performed prior to the sPLS-DA analysis to choose the parameters on a grid of keepX values (make sure you choose the appropriate M fold cross-validation and provide sufficient nrepeat in the evaluation model, except for ‘loo’ where it can only be run on 1 repeat), also check the stability of the features selected during the cross-validation process. The graphic above shows that the error rate decreases when 2 components are included in sPLS-DA, wherea the third component seems to add noise. The diamonds indicate the optimal keepX variables to select on each component based on the balanced error rate. We now run a classic sPLS-DA. 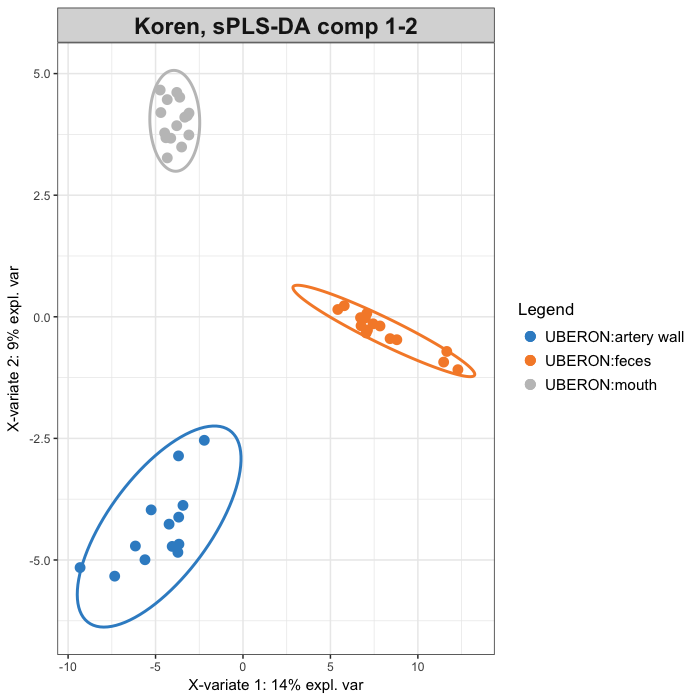 The sample plot below shows the sPLS-DA first two components. The ellipse are 0.95 confidence interval ellipse for each body site. The classification performance of the sPLS-DA multilevel model can be assessed using the function perf. The mean error rates per component are output and type of distance are output. Here do not hesitate to increase the number of repeats for accurate estimations. The mean overall and Balanced Error Rate are output for each component. The code below outputs the first selected OTUs and their coefficient (from the loading vector) on the first component. Consider the absolute value as an indication of the importance of the OTU in the microbial signature, while the sign generally indicates positive / negative correlations between the OTUs, relatively to the proportions of the others (see also with a plotVar output). To this list of selected OTU displayed from the most important to the least important we can combine their stability measure from the perf output (i.e. how often were they selected across the different CV runs). The plotLoadings shows that all OTUs selected on the second component are highly abundant in the tow other bodysites. The sign indicates the opposition between body sites. 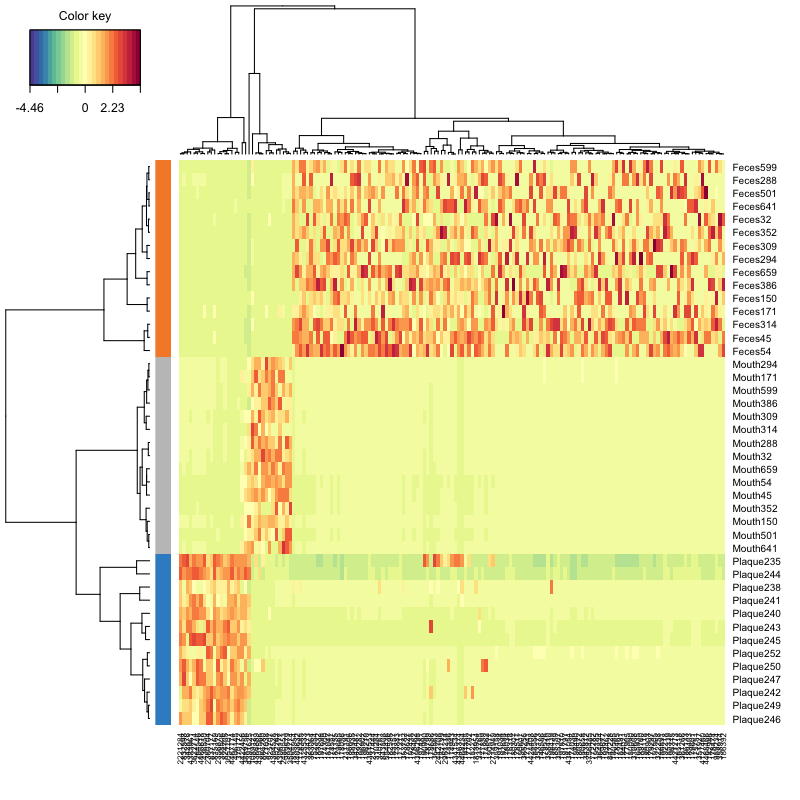 A heatmap will also help understanding the microbial signature. We represent clustered image maps (with Euclidian distance, Ward linkage set by default) for the OTUs selected on each sPLS-DA component. 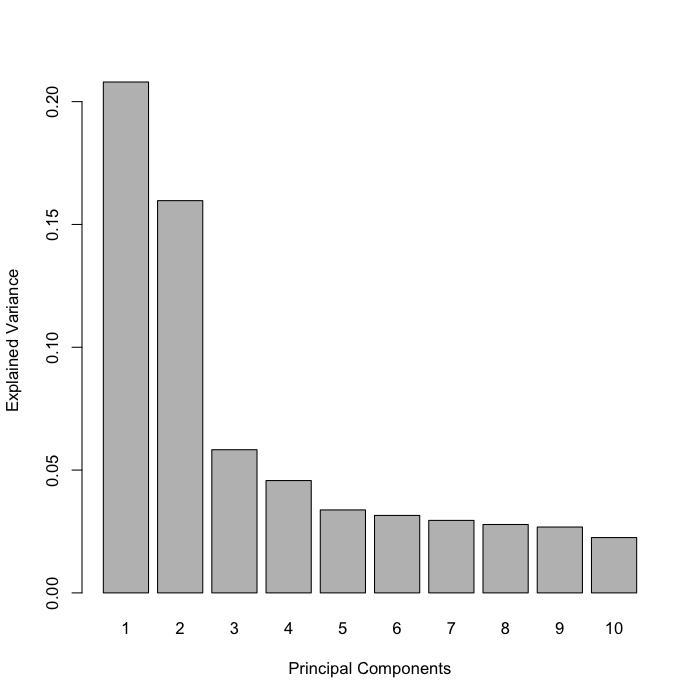 The abundance values that are displayed are the normalised, log ratio transformed values. All OTUs selected by the sPLS-DA model are displayed, other options can include a specific component, or a specific cutoff of 'association', see ?cim.